Your choice of community plays a big role in your level of happiness when buying your first home. Everyone needs to find a neighbourhood that meets their unique needs. That’s why we’ve always focused on building communities people want to live in. We think the following amenities are some of the most important, and it’s smart to look for areas that have these features. Even if you’re not planning to take advantage of a particular amenity right now, just having it available can increase property value. If you have children, playgrounds are a must. 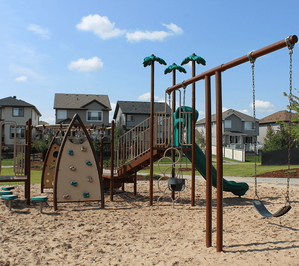 Many young families look for playgrounds within walking distance of their new home. A nearby playground allows the kids to get their wiggles out, but it also acts as a natural gathering spot for the community. This is a great place to meet your new neighbours and have kids start making friends that will last a lifetime. While working out at a gym has its advantages, it’s also nice to be able to to get in a bit of exercise right outside your door. Many communities are incorporating walking or biking trails into its design. For those who like having easy access to nature trails, you’ll find some communities that have private entrances to public lands. If you plan to make walking around your neighbourhood one of your primary forms of exercise, you’ll want to consider the view. Certain community plans include things like protected wetlands or urban forests. More and more young adults are concerned about the impact that their actions have on the environment. We know that driving everywhere isn’t good, but you don’t always have a choice when you need to pick something up from the store. To help change this, you’ll find that a current trend is developing communities close to a retail area. 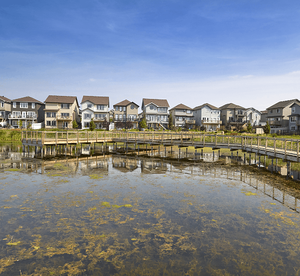 This might not seem like a "necessary" thing to look for to some people, but you can’t argue that having a lake or pond in your community creates a relaxing feeling. Many people choose communities with this feature because they’re looking for a scenic backdrop that will encourage them to be more active outside. Some communities may even allow recreational activities like swimming or kayaking in the lake. If you don’t have kids you might underestimate the value of a high-quality school nearby. Don’t do that! If you do have kids in the future, you’ll want them to receive the best education possible without spending a lot of time riding the bus. Even if you don’t have kids who will go to the local school, being near a desired school can increase the value of your property. Luckily, there are great schools throughout Edmonton, but you may find yourself drawn to the philosophy of a particular school. If that’s true, you’ll want to buy a home in a community nearby. Choosing a community for your first home is a very personal decision. Often, it’s about finding or feeling something that you can’t quite put into words. Touring communities is one of the best ways to find one that might be a good match for you. Start with your list of must-haves, narrow down your choices, and try to get a “feel” for each neighbourhood you're considering.